Yesterday and Today Records has been in the vinyl record business for almost 40 years. 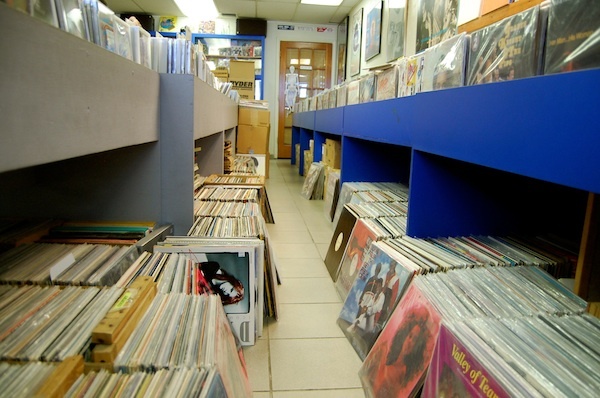 Across the street from the timelessly popular Bird Bowl bowling center on southwest Bird Road, up the rickety metal stairs of a tightly packed strip plaza, hides the hole-in-the-wall gem known as Yesterday and Today Records which holds the timeless gifts that are vinyl records. The perfect spot for buying, trading and selling. Upon first entering, consistent oldies jams bump from the speakers and there are crates on crates of records stacked nearly to the door, leaving little room for visitors to walk up and down the aisles. The selections are expansive ranging from popular oldies like Led Zeppelin, Jimi Hendrix, Simon & Garfunkel, to more modern artists like Aphex Twin, to even international and specific records. Yesterday and Today makes for the artistic connoisseur’s paradise as it’s a cultural whirlwind with every inch that may be better known to New College students than expected. Chern sits observantly behind his counter–also piled with records–and speaks to every curious customer with the utmost wealth of knowledge and breadth for music history and pressings. He and his friend starting up the business 36 years ago as of last June, but it wasn’t in the exact location it is now. Throughout the years, the store name has relocated and multiplied in locations with the late-’80s to the mid-’90s seemingly being their most successful and eventful era. There used to be a Yesterday and Today in Miami Beach focused on more techno, electronic, and dance music as the DJ scene was first spiking. There was also a store on Red Road and Bird Road, which was more spacious, that allowed them to have live performances from bands such as the Ramones–famous for songs like “Blitzkrieg Bop” and the rise of punk rock in general. “They [The Ramones] were all in our store and there’s actually a YouTube video of it you could watch that’s about 20 minutes,” Chern said. As of now, their current Bird and 92nd Ave. location is far tighter, but carries just the same, if not larger, collection of vinyls, CDs, cassettes, 8-tracks, you name it. The specialty as of now is in rarities of psychedelic, progressive, garage bands from the ‘60s and ‘70s, but the majority are records from the ‘50s to the ‘90s. Astoundingly there’s a quality selection of European imports that have different tracklistings and cover art for records, which makes for unique additions to one’s vinyl catalog. “There’s been a Renaissance on vinyl, you know it’s more young people getting into it,” Chern said. Chern may be right as the only visitors walking in were in the college student age range like my circle of friends and I are that frequent Yesterday and Today Records. While cassettes are rising in popularity in recent history–as they get more vintage, like records–records still persist as an optimal commodity in music for any age. Sunday 12 p.m. – 4:30 p.m.
Tuesday 12 p.m. – 7:00 p.m.
Wednesday 12 p.m. – 7:00 p.m.
Thursday 12 p.m. – 7:00 p.m.
Friday 12 p.m. – 8:00 p.m.
Saturday 11 a.m. – 8:00 p.m.